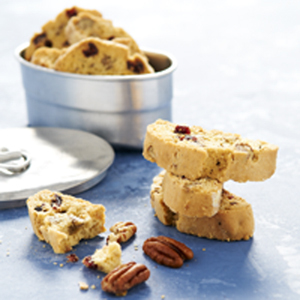 Indulge yourself in a little sweet treats with this Cranberry Pecan Biscotti recipe! - Whisk eggs and sugar till light. Add in lemon juice, lemon peel and vanilla. Add in sieved dry ingredients and melted butter, mix well. - Fold in the pecans and cranberries, mix well again. Place batter onto a tray lined with silicon paper. - Shape dough into a big log about 29-30 cm lengthband about 5 cm width. - Bake at 170ûC for about 25-30 minutes. Let it cool for about 10 minutes, then cut into slices of about 1cm thickness. Bake the slices again for about 8-10 minutes at 160-170ûC. - Let it cool completely before storing them in an airtight jar. - To work the sticky dough with some ease, lightly wet your hands with a splash of water. A drop of vegetable oil rubbed on your hands works well too. - To give the outside of the cookies a nice sheen, brush the logs of dough with a beaten egg. - Use a serrated knife or a bread knife in a sawing motion to get clean slices.